"Burnaby - 7641 Edmonds Street"
Photograph of Edmonds School, Grade 7 class. Identified: (3rd row, 4th from left) Una Patience. Teacher: Mr. Dave Gray. He was one of the finest baseball players ever produced in Burnaby and has a park and a swimming pool named after him. 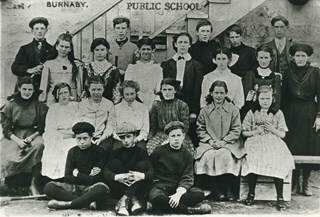 Photograph of a mixed grade class of East Burnaby School, on Edmonds Street. Douglas Road School was renamed East Burnaby School to differentiate it from West Burnaby School, which later became Kingsway West School. 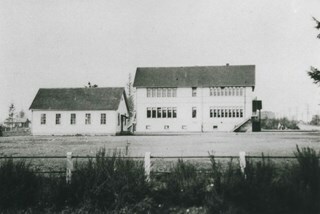 East Burnaby School was to become Edmonds Street School. Identified: (3rd row, 5th from left) Lillie Lewis. 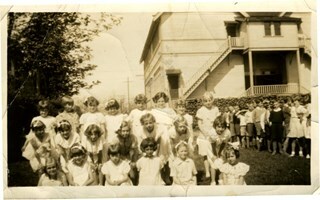 Photograph of Miss Benedict's class in lined up in rows outside of the Bungalow Building at the Edmonds Street School. Photograph of Mr. Hadley and his Grade 9 Div. 6 class standing on the steps of the new Junior High School building. The man standing in the back row, third from the right is believed to be Mr. Hadley. 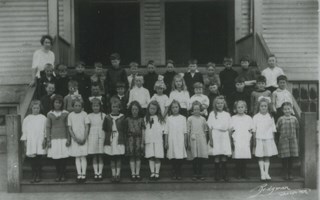 Photograph of Miss Benedict and her grade 2 or 3 class lined up on the steps outside the main old building at Edmonds Street School. 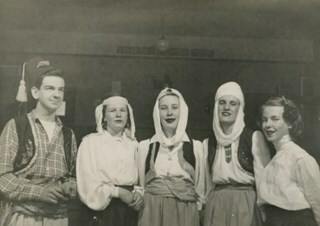 The woman standing to the left of the group is believed to be Miss Benedict. 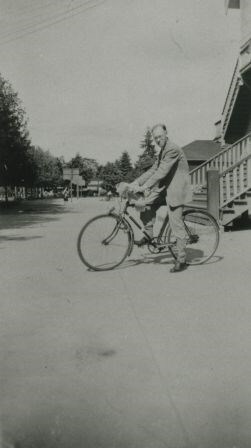 Photograph of a teacher on bicycle near the back staircase at Edmonds Street School. 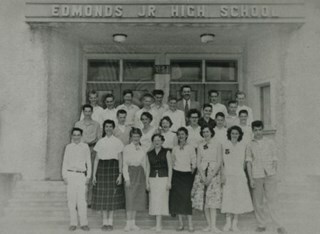 Photograph of the Grade 9 class at Edmonds Street School. The students are lined up in four rows; the first row of girls are sitting on the ground with their legs tucked to the right. Photograph taken on Inspection Day, with soldiers visiting Edmonds Street School. The school's woodpile is visible in the background. 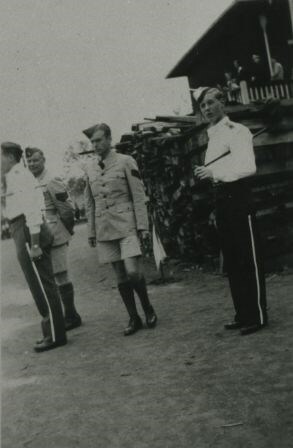 Photograph taken on Inspection Day, with three soldiers during their visit to the Edmonds Street School. 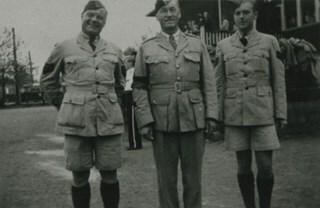 One solider is standing at ease, while the other two are standing at attention. 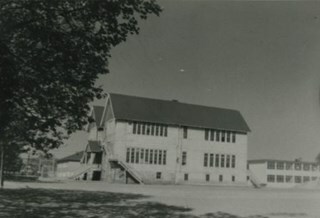 Photograph is a 3/4 view of the old Edmonds School, just prior to its demolition. 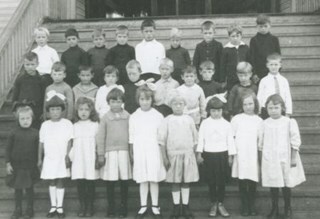 Photograph of the Edmonds School grade 1 class standing in rows on the steps in front of the Bungalow Building. 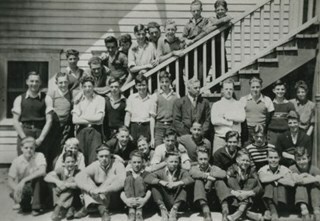 Photograph of the Edmonds School boys class class, some standing on the steps, and some seated on the ground at the back steps of the Edmonds Street School. Photograph of Mr. Fennell's Grade 8 class standing outside on the steps of Edmonds Street School. Lillian Ward, Alvera and Eveline Ward's eldest child, is standing, third from the left, in the front row. Photograph of Edmonds Street School. This photograph was used as promotional material for Ward and Leverington Contractors. 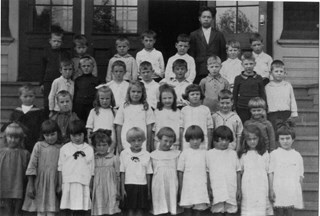 Continuation of title:"...- WARD & LEVERINGTON CONTRACTORS -"
Photograph of an Edmonds Street School Grade 1 class. The teacher (not in photograph) was Miss Lily Craik. 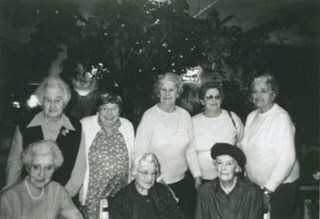 Photograph of a reunion of Edmonds Street School teachers and students. Back, left to right: Alice Clare Fraser, Pauline Davies, Nina Atkinson, Mary Anthony, and Vi Atkinson Wilson. Front, left to right: Alice Ashworth Webster, Freda Fennell, and Doris Dimmick Kinnear. 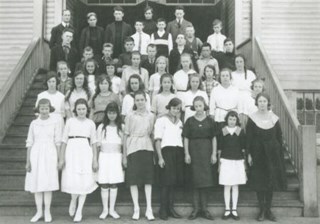 Photograph of an Edmonds Street School entrance class. Identified: Freda Fennell (front row, 2nd from right). The teacher is Mr. Fennell. Photograph of Edmonds Street School and surrounding area. Photograph of Edmonds Street School from the side. 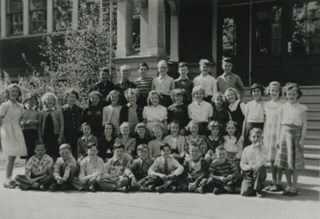 Photograph of an Edmonds Street School Grade 6 class. The teacher is Marie Morrow (nee Brown). 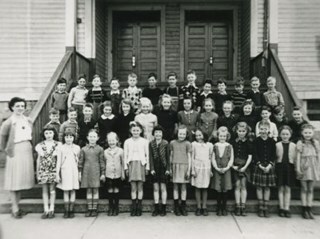 Photograph of an Edmonds Street School Grade 2 class. The teacher is Miss Fetherstonhaugh. 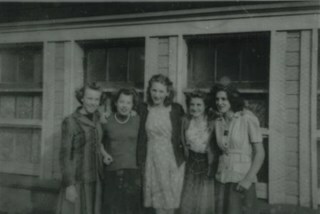 Photograph of a group of five young women standing outside Edmonds School. 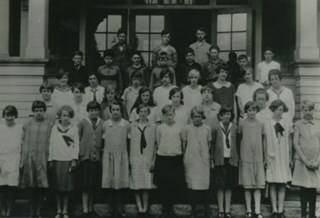 Photograph of a group of girls sitting and standing in three rows in front of what appears to be Edmonds Street School. 1 photograph : sepia ; 15 x 20.5 cm, mounted on card 25.5 x 31 cm + 1 p.
Photograph of the Division II class at East Burnaby Public School standing in front of the school building with their teacher, (Miss) Edith Crake. Continuation of title: "... , 1912 / Division II / Miss E. Crake, Teacher." Photographer's mark on recto of card mount reads: "The King Studio / 311 Hastings St. W. / Vancouver, B.C." 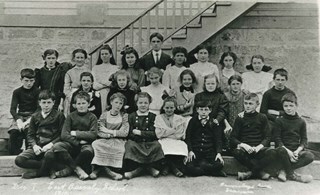 Photograph of students about thirteen years of age, on the steps at Edmonds Street School. There are twelve girls and twenty-five boys. The girls are mostly wearing sweaters an skirts to just above the knees, some with knee socks while others have stockings. Their hair is short, straight and parted. The boys are wearing mostly patterned sweaters, with cardigans or pullovers. Only a few have ties under V-neck pullovers. Their hair is short and swept to one side. An earlier catalogue record from 1976 and a signed gift form from the donor identify this photograph as a class at Edmonds Street School. Inscribed on the negative and printed on the lower right of the photograph: "9." Photograph of a class outside Edmonds Street School. There are twenty boys and twenty-one girls standing on the steps leading to the school doors. The boys have short hair generally brushed forward in bangs. Some are in shirts, others in sweaters. The girls have a combination of long and short hair, some flowing, some tied in ribbons or hairbands. They are wearing loose dresses with stockings. An earlier catalogue record from 1976 and a signed gift form by donor identify the photograph as Edmonds Street School. Inscribed on the negative, and printed on the lower right corner of the photograph: "Bridgman / Vancouver." Annotations in pencil on the back of the photograph read, "Helen Sutherland" and "Miss Mc," and an annotation in blue pen reads, "1922." 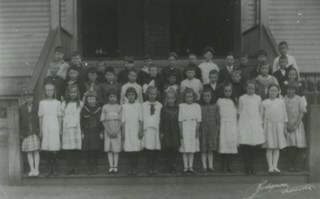 Photograph of a class sitting and standing in five rows on the front steps of Edmonds Street School. Percy Clogg is standing in the back row, seventh from the left. Lorraine McKin is standing on the far left in the third row, Annie Brownlow is fifth from the left, Lois Gilbert is seventh (her father had a barbershop near Bell's) and Randi Nelson is eighth (last in the row). Alice Tompkinson sitting on the steps in the second row on the far left, Isabelle Aida is third from the left, Margaret Hall (later Philps) is fourth, Sylvia Rae is sixth, Marjorie Dixie is ninth, and Rachel Rae (later McLeod) is tenth (last in the row). Jackie Jones is sitting on the far left in the front row, Chester Matheson is fifth from the left and Herbert Patience (from an old Burnaby family) is eighth (last in the row). 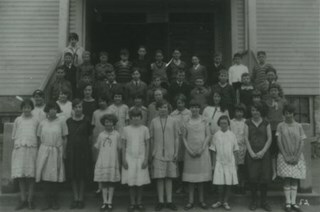 Photograph of Division IX at Edmonds Street School sitting and standing in six rows on the front steps of the school building. Their teacher, Miss Morgan, is standing at the back in the centre. Chester Matheson is standing second from the left in the back row, Percy Clogg is third from the left. Rachel Rae (later McLeod) is standing in the third row second from the left, Randi Nelson is standing fourth from the left and Alice Tompkinson is sixth (last in the row). Margaret Hall (later Philps) is sitting in the fifth row, third from the left and Phylis Jones is sitting eighth from the left (last in the row). Erling Johnson is sitting second from the left in the front row (the rest are unidentified). Note in black ink on verso of photograph reads: "Teacher - Miss Morgan"
Photograph of a class standing in four rows on the front steps of Edmonds Street School. Percy Clogg is standing third from the left and Erling Johnson is fifth from the left. Chester Matheson is standing in the second row, seventh from the left. Alice Tompkinson is standing on the far left in the third row. 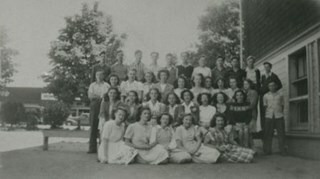 Rachel Rae (later McLeod) is standing in the front row, second from the left, Marjorie Dixie is third from the left, Sylvia Rae is fifth, Annie Brownlow is sixth, Randi Nelson is seventh, Margaret Hall (later Philps) is ninth, Mary Hamilton is tenth, and Phylis Jones is twelfth (last in the row). 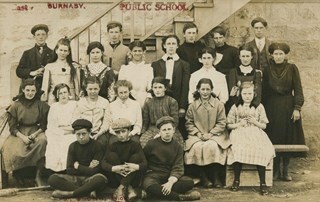 Note in black ink on verso of photograph reads: "Edmonds St. School"
Photograph of a class standing in three rows on the front steps of Edmonds Street School (their teacher is standing to the right at the back). Bert Davies is standing in the back row on the far left, Percy Clogg is fifth from the left and Chester Matheson is eighth (last in the row). Alice Tompkinson is standing seventh from the left in the second row, Marjorie Dixie is eighth and Rachel Rae (later McLeod) is ninth (last in the row). Mary Hamilton is standing in the front row on the far left, Annie Brownlow is third from the left, Philys Jones is sixth and Margaret Hall (later Philps) is seventh (last in the row). 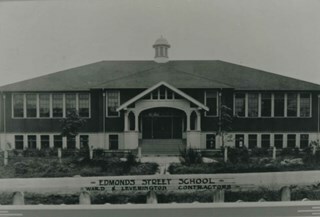 Note in black ink on verso of card mount reads: "Edmonds St. School - 1924"
Photograph of the newly built Edmonds Street school building standing by street car tracks. An earlier record from 1988 notes that the Edmonds Street School building was built between 1908 and 1912 in three sections. The record notes that in background across Douglas Road (now Canada Way) is the small hall on the grounds of St. Albans church. The record dates the negative ca. 1914. 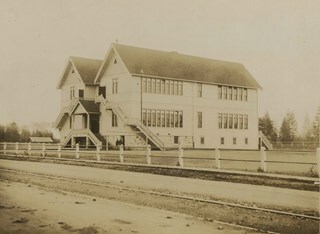 Photograph of the Edmonds school building by the street car tracks. A teacher is standing by the door facing the tracks and students seem to be entering the school. The Edmonds Street School building was built between 1908 and 1912 in three sections. The record dates the negative ca. 1914. Photograph of the exterior of Edmonds Street School. Photograph of the water tank at the Edmonds Street school site. 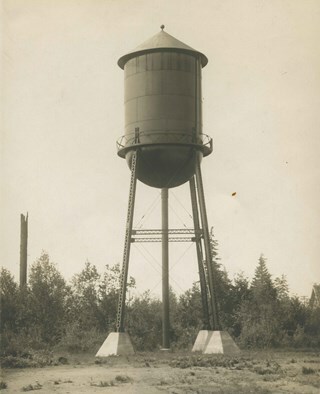 An accompanying typed caption reads, "Water Tank East Burnaby School House. British Columbia. 25 x 50 Ft. / Painted with Wailes Doves' "Bitumastic" Solution. Sole Agents: N. Thomspon & Co. Ltd., 847 Beatty St., Vancouver, B.C." Photograph of four Edmonds School students in costume as cast members of the play, "Ali Baba and the 40 Thieves." Photograph of the Edmonds School United Nations flag. 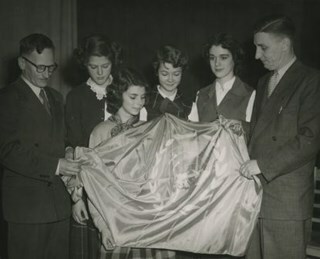 Four young women and two men are unfolding it. Identified: Jack Davy (left) and Bill Good (right). Stamp on back of photograph reads, "Ray Allan / The Allan Studios / 3763 Kingsway, Burnaby, BC / Phone: Dex. 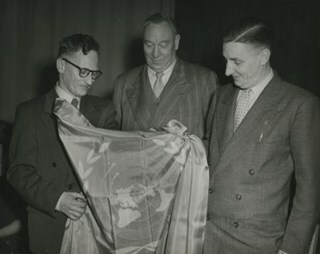 5766"
Photograph of the Edmonds School United Nations flag and officials. Identified (on back of photograph): Jack Davy, C.G. Brown, and Bill Good. 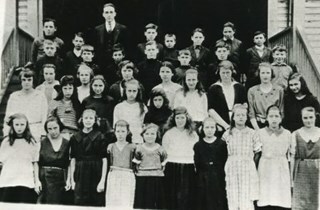 Photograph of an Edmonds Street School class. Front row, left to right: Alfred Price, Percy Morrison, Walter Harris, Gardiner Mercer, Charlie Buskin, John Welsh, Dennis Burton, Einar Anderson, and Walter Hopkins. Middle row, left to right: Roddy Matheson, Martin Knudsen, Harold Colwell, Eric Wagstaff, Alvin Darrak, Katie McAskill, Marjorie Philips, Marjorie McFee, Annie McDonald, Johnnie McCallum, Sid Warne, Bill Culbert, Arthur Clark, and Jim Blair. Back row, left to right: Len Moxham, Bertha Chilten, [unidentified], Stella Yeadon, Eleanor Boyd, [unidentified], [first name unknown] Lewis, Harriet Hall, Nora Lewis, Mary Maxwell, Nora Coldicutt, and Sid Lamb. The teacher (not shown) was Helena Craik. A sign at the right side of the photograph reads, "Keys with Mr. Sutton, Cormary Ave."
Photograph of a "Coronation Day" celebration at Edmonds Street School, June 24, 1911. All Burnaby schools were included. Children are posed outside of the school with decorations and banners.